Mobile operators blocking Skype and other internet voice calling (VoIP) apps could cause more than 18 million British mobile phone users to switch networks. In a survey by Rebtel up to 60 per cent of mobile phone users said they were prepared to switch networks if so-called 'over the top' applications, such as those which make VoIP calls, are interrupted. The poll said only 8 per cent believed operators had the right to stop users from accessing VoIP on their phones. Several mobile networks in the UK currently take steps to prevent access to VoIP services. Now, you make take a jaundiced view about Rebtel’s findings given their business model. However, a report from BEREC, the European telecoms regulators' body, claims that at least 20 per cent of mobile Internet users in Europe experience some form of restriction on their ability to access VoIP services. The BEREC report was compiled in a joint investigation with the European Commission, and was largely based on data submitted by 32 regulators, 266 fixed and 115 mobile operators. A questionnaire asked operators and regulators what traffic management techniques and practices are being applied currently. The most frequently reported restrictions are the blocking and/or throttling of peer-to-peer (P2P) traffic, on both fixed and mobile networks, and the blocking of Voice over IP (VoIP) traffic, mostly on mobile networks. As regards P2P, some level of restriction is reported by 49 operators (out of 266) on fixed networks and by 41 operators (out of 115) on mobile networks. As regards VoIP, some level of restriction is reported by 28 operators (out of 115) on mobile networks. Each of these types of restrictions affects at least 20 per cent of subscribers. Some examples of special treatment for over-the-top traffic reported by fixed operators are prioritisation of certain kind of traffic or applications at peak times (such as HTTP, DNS, VoIP, gaming, instant messaging, etc. ), and assigning lower priority to applications such as file downloading, P2P, etc. What’s been your experience? Have you ever been denied service when using VoIP? Internet con men have been fraudulently taking money from unsuspecting internet users by posing as the local police. The scam itself involves popup messages appearing on peoples home computers, claiming to be from West Yorkshire police, saying that they have detected illegal activity on the computer, and that they need to make contact quoting a voucher code in order to pay a standard fine. The scam is said to be so convincing that many have fallen for it already. “We are continuing investigations into this scam and want to remind residents to be wary of it and not to pay if they receive this message. This fraud is very deceiving as not only does it use convincing legal jargon, it also misuses the Force crest and logo. “If you see this message on your screen report it to us straight away and do not reply or attempt to pay. The scam is thought to be UK wide but has been very active in the West Yorkshire region. People are being advised to contact West Yorkshire Police on 101 is such a message appears on their computer screen. As part of our continued forward thinking and the desire to improve our already excellent service to our clients, we will be performing some major network upgrades on 1st and 2nd June 2012. As part of CCS’s ongoing commitment to provide a quality service to our customers, we are implementing these upgrades to add capacity and resilience to our core network locations. This will involve the removal of existing core routing hardware and its replacement with new hardware to provide a thirty fold increase in core routing capacity and a twenty fold increase in core switching capacity, adding additional diversity between the locations as a benefit. On the night of the 1st June, we will be working in the location housing the largest percentage of our leased line customers, our SharedBand core servers, many of our Helm based web servers, and much of our Voice over IP Platform. While each service will only be hard down for a short period – a few minutes per platform is anticipated – the sheer number of services makes for a lengthy downtime window during which one or more services will be unavailable at any one time. Traffic re-routing is anticipated at the beginning of the maintenance as we re-route as many customer services as we possibly can to maintain connectivity while the core routers are swapped. Following this, core switching and customer routing will be re-connected, then VoIP platforms, leased lines, servers and firewalls. We anticipate to be complete considerably earlier than 4am, however this is a very extensive piece of work, and it is quite possible we may require the full six hour window. On the night of the 2nd June, we will be working in the location primarily housing routing equipment, DNS servers and the larger percentage of our external connectivity plus a smaller number of leased line customers. At the start of the maintenance window we will be changing routing to force all traffic to another part of the network, which may result in a brief loss of connectivity. Following this, the core routers will be removed and replaced and customer services terminating at this site brought back into service. We anticipate the works on the 2nd June to be completed considerably earlier with perhaps only a total window of disruption in the order of two hours. However we are once again advising a six hour maintenance window to cover the unexpected. 1st June: Customers with none resilient Leased Line, IP Transit Services, Voice over IP services, SharedBand users and Helm based web hosting WILL be affected by service outages on at least one occasion. ADSL users may notice brief interruptions in service too. 2nd June: Customers with resilient Leased Line services may notice a loss of resilience. IP Transit Services single homed on Telehouse East WILL notice a loss of service. ADSL users may notice brief interruptions in service. Customers with fully resilient services, delivered from either London, Manchester or Leeds will notice only a loss of resilience. Customers based at either of the Leeds Datacentres will not be affected, although a lowering of resilience will take place during the change and on the evening of the 2nd June placing the site “at risk”. We have more than adequate resilient capacity in both the Leeds sites to handle the traffic throughout without interruption. To protect the network in advance of major events over the coming months and to increase capacity and resilience ongoing as we add further customers and services. In case a problem is discovered during or immediately post implementation, we benefit from having all existing hardware in an un-touched state to return to service. Our NOC will monitor the process throughout and provide early advice of any apparent issues. The new hardware is presently on a bench in complete testing in Leeds to burn in before being pressed into live service. Once complete, or indeed aborted for any reason, customers will be advised via their registered email addresses. Although this is planned maintenance, CCS will continue to monitor customer services throughout and will take every precaution to return services to an operational state in a speedy manner. Never the less, if you do feel there is an issue that is unattended to post the maintenance window, please do not hesitate to get in contact via the normal methods. Along with Facebook's re-design and the introduction of the much-maligned timeline, comes new privacy settings (often overlooked by users) that can protect information you'd rather keep private, and prevent third parties from accessing your information. Very few people actually explore this area and opt to just use Facebook’s default privacy setting. 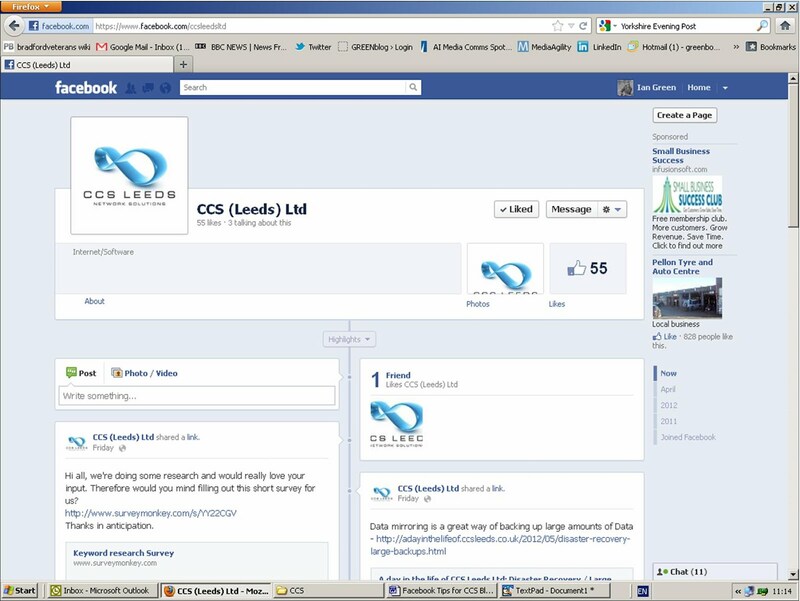 However, if you want to get into the tool box to ensure your information is safe and secure on Facebook here is CCS Leeds’ top ten tips on managing you Facebook profile. There are two ways to get to your privacy settings. In the upper right-hand corner of your Facebook page there’s the Settings drop-down menu that allows you to edit your Account Settings, Privacy Settings and Application Settings. How you set your Privacy Settings depends largely on what information you want to display. For instance, if you’re using Facebook as a means of showing off to potential employers or clients you may not wish to show information that you would not like you family to see. For most people though, Facebook is a means of either meeting people or getting your name out to as many people as possible. Decide which one you are. It’s important to understand what information Facebook considers public. They say: "Certain categories of information such as your name, profile photo and pages you are a fan of, gender, geographic region, and networks you belong to are considered publicly available to everyone, including Facebook-enhanced applications, and therefore do not have privacy settings." To protect your Profile Information, select Privacy Settings from the Settings drop-down menu on your homepage and then click to the Profile Information section. Your choices for privacy settings are: Everyone (literally everyone, including Google and other search engines), Friends and Networks, Friends of Friends, Only Friends and Customize. The Customize option allows you to include or exclude particular networks, or people - useful if you’re in a situation where you share Facebook with co-workers or family. The Contact Information section gives you the option to limit who can contact you outside of Facebook, via email, phone or post. Depending on your needs, select whether you want to share with everyone or just friends. 5. Who Can See You? The Settings tab includes all your basic information and you can control who sees your name on a Facebook search by clicking on Name, where you can decide to enter an alternate name, show only part of your name, or display your name in your profile and search results. If you don’t want your name shown, uncheck the box. Which email you use is another option on this page, depending on your privacy needs, it might be best to use an email you don’t mind sharing with the world to, or one that you want everyone to have. 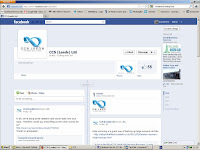 You may also sync your Facebook account with your other accounts in the Linked Accounts section here. Allowing friends to post to your Wall is another personal choice, easily made by checking or unchecking the indicated box. There’s an option to hide your friends so they won’t appear on your profile regardless of whether people are viewing it while logged into Facebook or logged out. To hide your friends, click on the pencil icon in the top right corner of the Friends box on your profile, uncheck the 'Show my friends on my profile' box to prevent your list from appearing on your profile. From the Settings drop-down menu and click on Block List. Note, though, that while friendships/relationships on Facebook will be removed when you block someone, they may still use some apps that you do and so you may still have some communication with them that way. Editing the privacy settings of the apps on your Facebook profile is another way to protect your privacy, given that most apps access the information on your profile as a condition of use. Select Application Settings from the Settings dropdown menu or go to the Applications and Websites section of Privacy Settings in the same dropdown menu to edit these settings. The page prompts you to edit your privacy settings after reading. The main point is you have to dig deep into the Facebook website to access your privacy settings and edit them - but it’s well worth it. If in doubt go to the Facebook/Privacy/Help page or check out this useful video. In recent months we have received a lot of enquiries from companies who have a requirement to back up large amounts of data and are looking for an off-site solution, as their traditional tape based systems are either too slow, unreliable or simply can’t handle so much data. As we all know, it is vitally important to have a reliable data backup so that in the event of a disaster, the data is easily retrievable, and the business can then continue operating as soon as possible. One new concept that we are keen on is the idea of data mirroring. This can be achieved by having a local backup device, such as a network hard drive array, mirroring it’s data to a similar device which is co-located in a purpose built Data Centre. The advantage of this is that local data can be accessed quickly from the on-site hardware which is then mirrored periodically to the off-site device using the internet. In the event of a disaster, the data from the external hardware would be an exact replica of the local data and therefore can be restored over the internet, or in some cases the mirrored device would be physically shipped out to the client on a next business day delivery. We have provided this very same service to a number of our clients already, and it does work extremely well on the right type of hardware so long as it is configured properly. In the past we have used hardware which has been manufactured by a company called Synology. They provide a wide variety of network storage solutions and the software includes the mirroring service along with many other useful features. For more information, please do not hesitate to give us a call on 0113 294 6699. Just some of the attendee's. On Friday 27th April 2012, we held an event to mark the official opening of our new Data Centre. The event was well attended by over 30 guests who consisted of clients, potential clients and local Member of Parliament Mr George Mudie. Attendees were treated to a guided tour of the Centre’s facilities and refreshments were on hand throughout. Nick demonstrates a power cut. Nick Ryder, Technical Manager at CCS (Leeds) Ltd gave a short but entertaining speech, during which he demonstrated, with the help of colleague and MD Peter Knapp, what would happen if the power supply to the Data Centre was disconnected. There was a nervous hush as Peter turned off the main power supply, and then relief as the graphs showed that the generator had sprung into life, thus maintaining continuous power to the Data Centre. What made this little demonstration more poignant was that there were a number of CCS’s co-location clients at the actual event, and to say that they appeared slightly apprehensive would be an understatement. All in all it was a great afternoon and we would like to say a big ‘Thank You’ to all of those who attended.